Original date is sold out but due to huge demand another date has been added. Details currently available to the mailing list only - so sign up HERE now to be among the first to hear about it. I'm so excited to be able to offer a foam-free, large installation class this coming autumn. 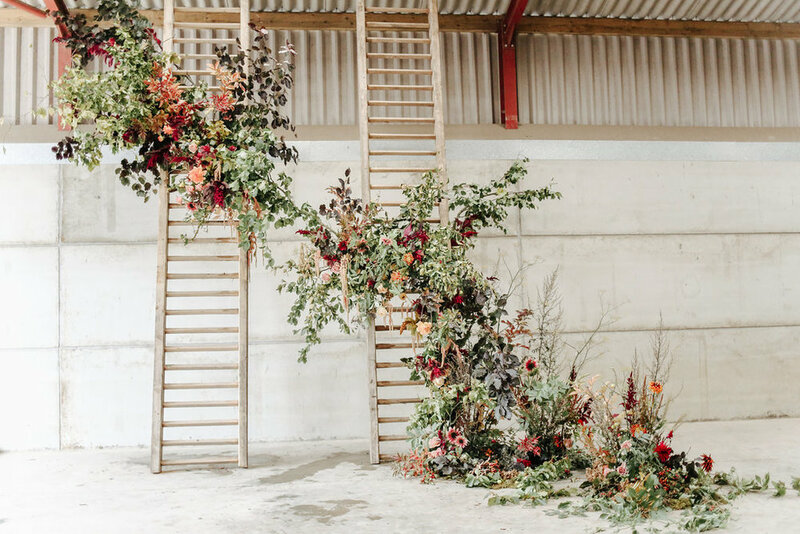 Aimed largely at florists wanting to learn how to create large, dramatic installation pieces, but also at other creatives wanting to have a day on a flower farm, surrounded by beauty, nature and lovely people. 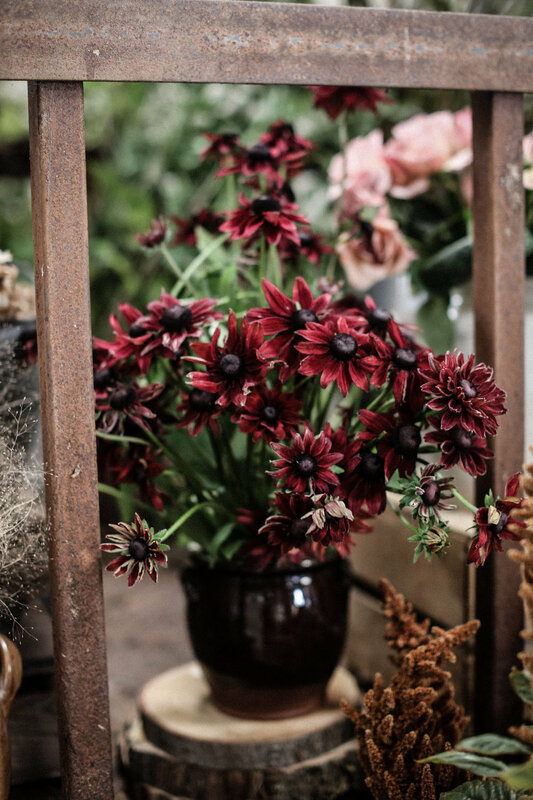 Your opportunity to enjoy a jam-packed day of floral loveliness at Holme Flowers, part of Holme Farm, a beautiful working farm run by three sisters, Wendy, Sue and Jayne. 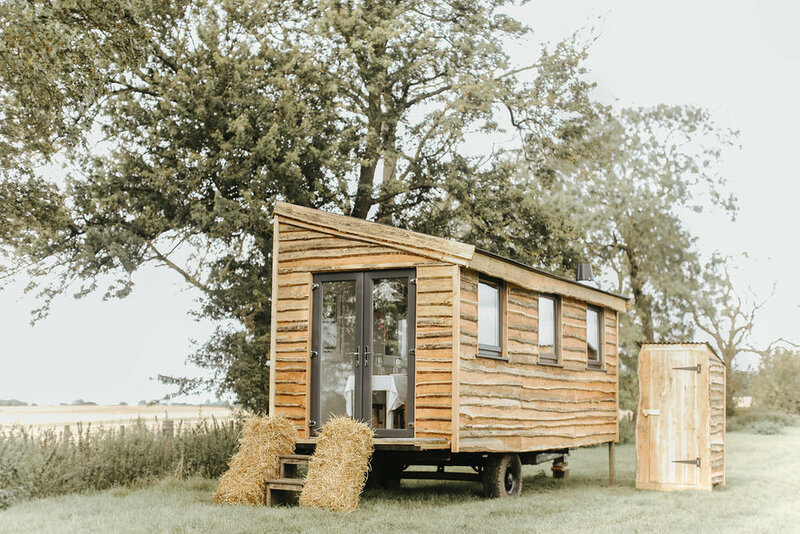 Located in a delightfully idyllic and secluded hamlet in rural North Yorkshire, UK. We will start with a guided tour round the Holme Flowers flower field at it's late summer/ early autumnal best. You'll walk down row after row of voluminous sweetpeas, their scent hanging heavy in the air, be astounded by the incredible dahlias in every colour imaginable, duck to avoid the passion flower vines, the clematis straining to romp away and the cobea vine with it's incredible blooms. The sunflowers will dwarf you, the roses will hypnotise you. You can't help but be blown away by the beauty of this flower field. 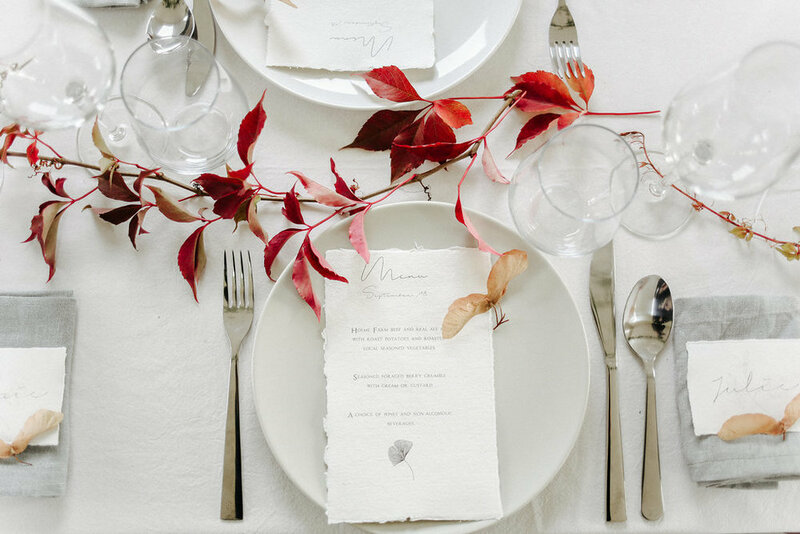 Enjoy a mouthwatering autumnal feast in the last of the summer sunshine, all made by the three amazing sisters (there seems to be nothing they can't do), we'll laugh, chat and get to know each other over the wholesome food and wine. There will of course be learning too, I will take you through how to create jaw droppingly beautiful large pieces, without the use of foam. After I show you where to start and how to get going, we will work together as a group to make one large installation. 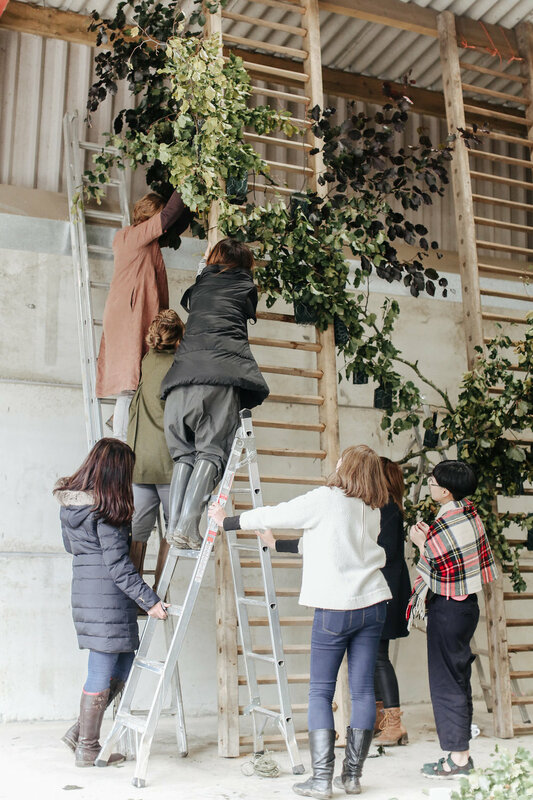 Creating large scale floral installations is one of the things I love most and is one of the things I get asked about most, it really seems to be the thing most people worry about, so I have designed this full day class to allow us to really delve deep into the whole concept. So many large designs rely heavily on floral foam, but the foam doesn't break down EVER so the more we can learn to adopt the 'old ways' and go back to the days before floral foam became such a staple ingredient for florists the better. All equipment and flowers will be provided and you can take armfuls home with you at the end. There will be high working and ladder work but if you prefer not to go up a ladder there is absolutely no obligation to do so. 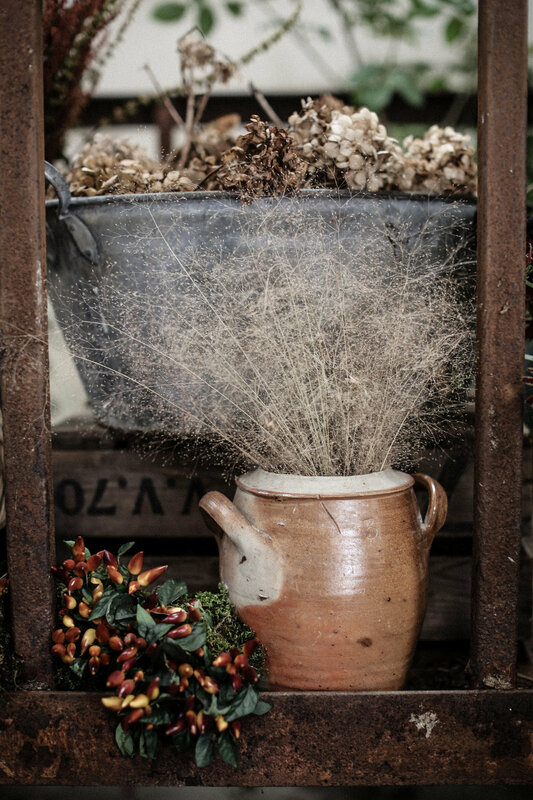 All images are courtesy of Holly of Belle and Beau Fine Art Photography from last years class at Holme Flowers. If you attended last year and want to come again, but are wondering whether it will be the same again, don't worry it won't. We will be in different areas of the farm and of course it will be foam free too. Places will be strictly limited to 10 and advance expressions of interest have been extremely high, so early booking is highly recommended. Wet weather plan - in the event of a good old English downpour, we will still be able to carry on regardless, just bring all the options from waterproofs to suncream for the morning outside picking, walking and foraging. Holme Flower Farm, Holme on Swale, near Thirsk, North Yorkshire.